YA Bound Book Tours: Blog Tour Kick-Off: Here's the Thing by Emily O'Beirne! Blog Tour Kick-Off: Here's the Thing by Emily O'Beirne! 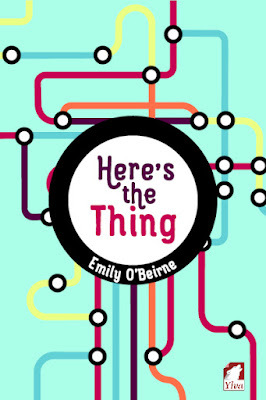 YA Bound Book Tours is organizing a Blog Tour for: Here's the Thing by Emily O'Beirne. This tour will run from September 26th to 30th. Check out the tour schedule below. It’s only for a year. That’s what sixteen-year-old Zel keeps telling herself after moving to Sydney for her dad’s work. She’ll just wait it out until she gets back to New York and Prim, her epic crush/best friend, and the unfinished subway project. Even if Prim hasn’t spoken to her since that day on Coney Island. But Zel soon finds life in Sydney won’t let her hide. There’s her art teacher, who keeps forcing her to dig deeper. There’s the band of sweet, strange misfits her cousin has forced her to join for a Drama project. And then there’s the curiosity that is the always-late Stella. As she waits for Prim to explain her radio silence and she begins to forge new friendships, Zel feels strung between two worlds. Finally, she must figure out how to move on while leaving no one behind. Thirteen-year-old Emily woke up one morning with a sudden itch to write her first novel. All day, she sat through her classes, feverishly scribbling away (her rare silence probably a cherished respite for her teachers). And by the time the last bell rang, she had penned fifteen handwritten pages of angsty drivel, replete with blood-red sunsets, moody saxophone music playing somewhere far off in the night, and abandoned whiskey bottles rolling across tables. Needless to say, that singular literary accomplishment is buried in a box somewhere, ready for her later amusement. From Melbourne, Australia, Emily was recently granted her PhD. She works part-time in academia, where she hates marking papers but loves working with her students. She also loves where she lives but travels as much as possible and tends to harbour crushes on cities more than on people. Blog Tour Kick-Off: Unlocked by Margo Kelly! Cover Reveal: Forgetting Yesterday by Ava Wood! Cover Reveal: The Life Group by Maura Jortner! Book Blitz Sign Up: Sunrise by Scott J. Abel! Book Blitz Sign Up: Book Heist Giveaway! Book Blitz Sign Up: The Glitch by Ramona Finn! Trailer Reveal: Lies I Live By by Lauren Sabel! Social Media Blitz: Nickel by Robert Wilder! Blog Tour Kick-Off: One Night by Deana Cabinian! Book Blitz Sign Up: Novus by Crystal Marcos!